What about PAS? Parent alienated syndrome? In my case, the abusive absentee dad has brainwashed his adult kids against me. He lost his visitation rights when they were young because of his abuse. His goal with my professional help was to drive me crazy. I realize 2 out of 3 have gave up their power to allow him to brainwash them against me. I did it all raised my 3 by myself with the check that came once a month. Instead of being thankful for all I did for them, I am their target. Their dad appears to them to be the nice man that never did anything and he has the money so they see that. My.oldest daughter is my hero! She told me herself I didn’t cause it, I can’t control it, and I cannot cure it! I told them I love them but I am moving on with my life! Thanks for this group! Haven’t seen or heard from my daughter in sixteen years. Her mother won in her effort to destroy our relationship with not only me but the entire family. Yes, I have tried everything to stay connected. I paid thirteen hundred dollars a month in child support for more than nine years. I don’t know that there are any answers after eighteen years of living with out your only child. I have not found any in almost two decades. Everyone always wants to tell you what you should do or try but they never listen when you tell them you already have. I remain hopeful and positive one day there will be an answer beyond thoughts and prayers. Not sure I will ever understand how vicious someone can be to do this. Yes, I understand life must go on but it never goes away. I guess we all ask the same question…Why? Joe, I am a mother and I live the same pain. I raised my ex’s boys like they were my own, for 10 years. When I separated from my ex I was warned he will destroy me. He slowly alienated my daughter and this still happens under the eyes of professionals I hired. Why? No one will know the answer why these parents choose to hurt their children with what they do. Ultimately, what they do is the most subtle way of abusing your child. All for revenge, because they cannot think further than their own war. Because they are narcissistic and they like to control and win. My heart tells me one day things will change and these children will wake up when they become adults. It is never too late. I persevere and take anything my daughter throws at me ( with a lot of pain). And I show her and tell her all the time how much I love her. Unconditionally. She suffers inside, and she is no longer the sweet girl she was. All we can do is love them. For me, the why question is gone. yes my ex is like your story — he married because his mother told him to. I married him on the rebound that guy that dumped was better looking than Elvis what happen between us I do not know some day the truth will come out. I had 5 children with my husband — he did not want number 4 and 5 gee how come he would not take responsibility and use a condom. The second son and the third died young God gives us this for a reason I do not yet know the answer. The children dad is a alcoholic and is doing the gray rock at this time and truly am waiting for him to fall he will alcohol is more powerful than God and of course it will be my fault I can handle it another part of the abuse. Joe, my heart goes out to you in so many ways. My mother ground into our heads daily what a loser my father was and never let us forget what a terrible dad he had been. She had ways of saying things that you just believed her word was the truth. Well, he wasn’t a very fit father and could be a jerk in some ways. But he hardly had a chance with her hanging around his neck like the town crier telling his children how bad he failed us all the time. I didn’t understand my father was a human being with human emotions just like everybody else. I saw him as an object instead of as a person because that is how she wanted me to see him. It wasn’t until I had difficulties with my own kids that I realized he was a man with feelings, though he could be somewhat quirky at times. He spent about twenty years after their divorce alienated from his children. Just like she wanted. And in her eyes it was all his fault. She never missed a chance to remind us of how weird he was. That he was “an unformed human being”.Unformed human being means nothing. It’s junk she made up to make us disrespect him. The truth is she felt embarrassed because she married somebody who wasn’t what she wanted. Every day he was a reminder she had made a stupid mistake and she didn’t like being reminded she was human like the rest of us. He suffered unbearable heartbreak all those years.After he died we found a letter he had written to me thirty years before. He apologized for his faults and for hurting us. If my house ever catches on fire I will grab that letter because losing it would be like losing part of who I am. I pray someday your daughter will think things that have never occurred to her before. Ideas about meeting you. Such thoughts in my opinion can only be planted through prayer and I am praying with all my heart right now it will happen for you. It’s so unfair to keep a father from his children. That’s all great advice for the parent doing the alienation . Getting so far out of hand with the power the alienator has over the child , not being held accountable , for the damage inflictedon the child and rejected parent what good is Counselling or Therapy? What incentive does the Alienator have to want to change. I so understand this point of view and my heart breaks for every person going through this. The pain, sometimes,is unbearable, isn’t it? I am so in need of other people who are going through this, because you are the only ones who can understand me. I truly feel like an alien out in the world, without my child and without closure,trying to live through an extreme case of parent alienation. My center is gone. So, I just want others to know that you’re not alone and don’t give up on yourself. You cannot appeal to the consciousnes of reasoning and rationalization of a narcissist. Generation After Generation has suffered this tactic of seperation of the family unit ! Some call it Socialism.? I’m laughing so hard right now. Favored parents love to put down the other parent, they aren’t reading this article looking for help! I stumbled across as a targeted, rejected parent. If I could get my “co-parent” to acknowledge even one of these behaviors in herself that would be a success. Instead she does the complete opposite of what you recommend. I pay her a large sum is money in alimony and child support so she can remain home with kids and I am accused of never having time for them. Or yes, once I got upset with my child for he bad behavior and raised my voice and that is what she focuses on each time we talk about why my daughter does not want to spend time with me. Get a grip. Wish you luck in convincing narcissistic parents they are doing anything wrong! I am thrilled to find this group. I am in the thick of losing a second child to the grips of my ex. He is so covert it’s sickening. And he’s a professor so he comes across as so trustworthy and morally sound by being such an supposedly excellent and attentive father. And the professionals are ill equipped to see what’s truly happening. 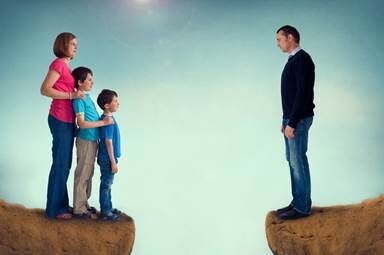 The only people who truly understand the depths and profound dispair this has on the children and extended families are the targeted / rejected parents. We need to hold each other up. I would love any tips or coping mechanisms any of you have found worked.